What is the Relationship Between Basement Walls and Floor Leaks? 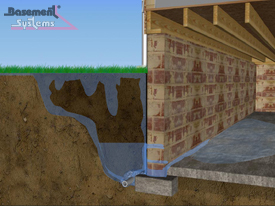 The joints between basement walls and floors is a common source of water leaking into a basement. 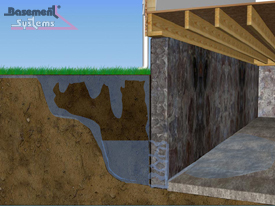 The way basement foundations are constructed and the different materials used together contribute to the common problem of water leaking through a basement wall and/or basement floor. 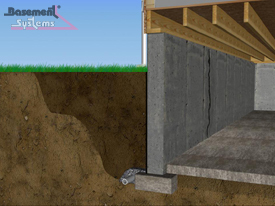 Each of the four foundation types described below has unique characteristics that should be considered when solving a wet basement problem and designing a waterproofing system. The one universal factor contributing to a wet basement is the poor performance of exterior drainage systems. Even though many houses have footing drains as shown in the drawings below, these drains don’t perform well if at all. The drains are easily crushed during the backfilling process and will will eventually clog with silt and plant roots, rendering it useless. POURED CONCRETE WALLS typically leak along the joint between the floor and the wall. High hydrostatic pressure outside the foundation can cause water to seep through solid concrete walls. It will also force water into the basement along the crack between the floor and the walls. Cracks that form in walls also provide pathways for water to enter the basement. CONCRETE BLOCK WALLS will leak along the floor/wall joint, just like poured concrete walls. But the mortar joints between individual concrete blocks also have the potential to leak. Pressure against a concrete block foundation often weakens mortar joints, causing cracks that allow water to penetrate. The hollow cores in concrete blocks can fill with water, causing the foundation to leak long after the soil outside the house has dried out. The same issues occur with cinder block walls. STONE WALLS are found primarily in older houses. Because stone masons may not have had the time, materials or skill to construct long-lasting waterproof walls, ground water can seep or even flow into the basement through gaps or cracks between stones. An interior perimeter drain system is necessary to capture water that leaks though walls as well as water that leaks through the floor/wall joint. CLAY TILE WALLS are found in some historic houses. The floor/wall joist is a common leak location. So are the mortar joints between clay tiles. Like concrete blocks, clay tiles have hollow cores that can become filled with water, creating a reservoir of water that can leak into the basement over time. Because clay tile is brittle and more easily damaged than other masonry materials, care must be taken when working on this type of wall. An interior French drain system is effective for ALL foundation types. 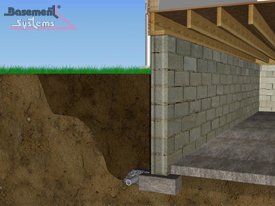 Every type of basement foundation is prone to water leaking through walls as well as along the floor-wall joint. An effective waterproofing system should aim to capture this leakage as it enters and before it can pool onto the basement floor. This is the principle behind the WaterGuard® drainage system from Basement Systems.